As discussed in the prior two posts, these three elements can be combined in many different ways; arriving at the proper combination is part planning, part art, and part trial and error. But assuming you've gotten this far, it still leaves the question of what price to charge? First, let me state that I've been pricing goods and services for many years and for those of you who like precision and certainty, the pricing process is messy and imperfect. Nevertheless, there are several methods that can be used to establish initial pricing. These tend to fall into two group: tangible pricing and value pricing. Tangible price methods stem from obtainable data. Value price methods require more exploratory efforts. This post will deal with tangible price methods. The most basic and simplest to understand is cost plus pricing. This is where you add up your costs, tack on your target margin to set a price. Remember that one of the key objectives in pricing is to charge enough to cover your costs and make a profit. At least on the surface, this would seem to address the issue. However, cost plus pricing often results in a price that is not competitive in the market place (i.e. think $500 screwdrivers for the government). So what to do? First, you cannot ignore cost but there are two kinds of cost: direct and indirect. Direct costs, typically classed as Cost of Goods Sold (COGS), are the immediate costs tied to delivering a unit of product or service. For example, if you're selling a widget, the cost of the parts in the widget plus the amount of labor time to build the widget plus the cost to ship it are direct costs. Your pricing must be greater than the direct cost. Otherwise you are shipping dollar bills out with each unit. On the other hand indirect costs are not directly tied to the cost of delivering a specific unit, though they may be needed for producing the product or service. Often times they are relatively fixed costs like engineering wages, rent, or electricity. They are real costs needed to support operations but not directly assignable to a specific unit of product or service. These costs are often allocated across the total units produced. For example, if you have $500/month in rent and build 5000 units/month, you might allocate $0.10 of this cost to each unit built. But if you only build 500 units/month, you would allocate $1.00 of this cost to each unit. And this is what complicates cost plus pricing. To cover this, do you charge $0.10 or $1.00? Not only must you charge more than the direct cost, in order to make a profit, you must charge enough more to cover the indirect costs at a particular volume level. To further complicate the picture, the line between a direct cost and indirect cost is often murky. The bottom line is that you should not use cost as the sole means of establishing price, but you cannot ignore it either. And if you find that you can't price high enough to cover all of your costs or reduce your costs sufficiently, you may have a more fundamental business model problem. 5-10 quotes should enable you to get a feel for the average and range of competitive market pricing. Keep in mind that this just establishes a reference point. Depending on your pricing strategy, you may choose to price higher or lower than market. In some cases, there may not be a directly competitive product or service to your offering. In this case, you should look at pricing for competitive substitutes. Competitive substitutes are products or services that in combination with other things allow the buyer to gain the same functionality or achieve the same goal as your product or service would directly. As an example, if I need to add up a bunch of numbers, I can use a calculator, my computer, my cell phone, my digital watch, a pen & paper, an abacus, or just do it in my head. All are competitive substitutes to each other with different costs associated with purchasing the different items. Depending on the strength of the competitive substitute in achieving the buyer's purchase objective vs. your product or service, the price being charged may limit the premium you can charge. For example, lets assume that high speed rail service between San Jose, CA and Los Angeles actually becomes a reality in my lifetime. If I have to price the service, three competitive substitutes are plane, car, or bus. Transit time by high speed rail is 3 hours, plane is 1.5 hours, car is 6 hours, and bus 7 hours. Assuming I own a car, this is the cheapest in dollars, involving maybe $50 in gas. The bus is about $55 and I don't have to drive; I can spend the time reading or on my laptop courtesy of mobile Wi-Fi. The plane is ostensibly the fastest but when you add all the security and boarding issues associated with air travel, total time is probably closer to 3-3.5 hours for a ticket price of $120. So what should the price of a train ticket be? You can definitely charge more than the car or bus because of the speed advantage. The plane is the nearest serious competitor so a floor reference price would be $120 per ticket. Could it be more? Absolutely. It depends on how well the train positions its value to its target ridership; this moves into the realm of value pricing. While method's 2 & 3 look at competitive pricing, another way to determine pricing is to survey potential buyers. This first involves understanding who are your target customers. Customer surveys work best for familiar product categories with fewer options. Most people find it difficult to establish an anchor price point for innovative or unfamiliar product categories and will therefore skew answers low. Products with many features can be confusing, although conjoint analysis can help establish feature/price tradeoffs. It also helps to have product samples or some kind of demo; people give better feedback with things they can see or touch versus abstract concepts and ideas. 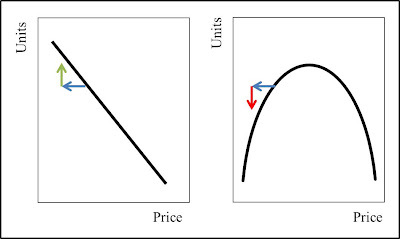 But one potential strength of this method is that it may tell you something about the nature of the price-demand curve. Why is this important? 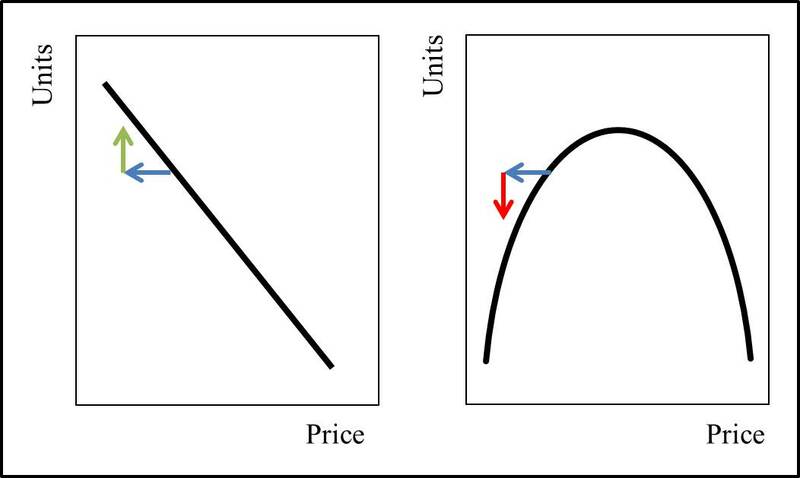 Let's look at two price-demand curves. The one on the left is a stereotypical commodity demand curve where demand falls with increasing unit price. The one on the right is typical of many branded goods where too low or too high a price can cause demand to fall (e.g. the Mercedes C-Class example mentioned in the first post in the series). As you can see, depending on what the nature of the curve might be, and where you are on the curve a decrease in price may or may not improve demand. The other pro of this method might be to identify the existence of an optimum price point different from the current competitive market price. For example, when LCD TVs first came out, a 42" model was ~$4500. But the LCD TV makers knew this was not the optimum point; it was a price constrained by their costs. By conducting customer surveys, they determined that $1000 was the magic inflection point at which demand would skyrocket. They worked diligently to drive costs down so as to be able to price to this point. Sure enough, 42" LCD TVs hit the $1000 retail point in 2008 and took off, in spite of the fact that a global recession was underway.